Many incredible mages exist throughout the multiverse. They have unlocked the secrets to incredible power, twisting magic into spells rarely seen by fellow spellcasters… if at all. Those of great power tend to be reclusive, for a powerful mage makes many enemies. Some even take their magic to new and epic levels. Whether they become archmages, demigods or just powerful spirits locked in some dimension; some yearn for a student to pass their work onto in some capacity. After all, while some magical secrets should die with their creator, other gifts should be passed on. The Ancient Magi Patron provides one such method. Those in service to the ancient magi are typically scholars of the arcane, seeking ways to expand their knowledge and craft. Many are devotees to the very arcanist they serve, while some are just greedy and desire to steal forgotten magic for their own benefit. More often than not, their arcane superior is aware of their intentions and will use them accordingly. Many ancient magi aren’t even on this plane anymore. Many of them have long since passed away or are locked in other realities. Some have been stranded in the Astral Plane, effectively frozen in time; while others are permanently sealed in unknown demiplanes. Some lucky ones dwell on material planes, but try to make their presence as nuanced as possible. 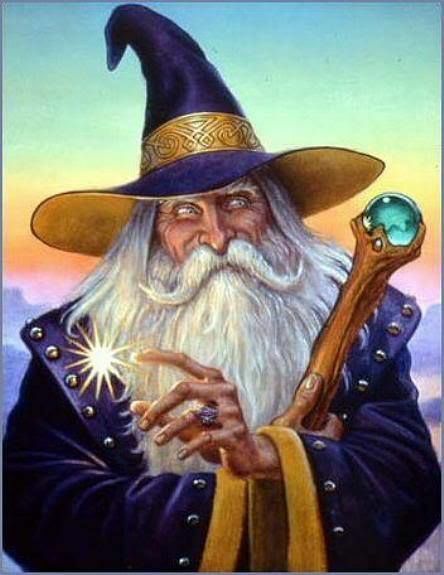 Great mages like Mornenkainen and Elminster are examples of such magic-users. AUTHOR’S NOTE: Looking back, I wasn’t really too happy with my original draft. The general idea was solid, but I tried to make it feel too much like a binder vestige instead of a patron. Plus, some of the mechanics were made when I didn’t fully understand the warlock class. Now, some of the ideas here are heavily experimental. Giving a class ability to cast a certain spell 1 – 2 per day… and at the strength of the warlock’s level? That might be a bit strong, but I wanna see where I can develop this. None the less, I wanted to make a warlock patron that carries both a bit of sorcerer and wizard flavor to it. Plus, I created a quick-n-easy class variant for those of us who are nostalgic for the Archivist from the 3.5 Book, “Heroes of Horror”. So, I never actually got around to seeing the revised ranger in play until recently. With that, here’s a few concept I propose for fixing a couple of (what I perceive to be) bugs. Natural Explorer. This MUST tie to a type of environment. At Level 1, choose two environment types. At levels 6, 11 and 16, choose another. Benefits are granted in that environment. Meanwhile, the Advantage to attack enemies only works for ONE ATTACK while in that environment. Natural Explorer (ALTERNATE). Add proficiency bonus to initiative checks while in your terrain. 1/Short Rest gain advantage on an attack against a favored enemy. Beast Conclave – Companion’s Bond. Companion only gains proficiency in Strength and Dexterity saving throws, not proficiency in ALL saving throws. Alternatively, choose two saving throws instead. Deep Stalker Conclave – Underdark Scout. You do not get the extra attack on your first turn. Possibly grant 1d6 sneak attack damage instead. IMAGE CREDIT: Sojourn by Todd Lockwood, copyright 2015. Drizz’t Do’urden is copyright of Wizards of the Coast and R.A. Salvatore. UPDATE JANUARY 2019: I’m hoping to redo some of these, as well as add more robots. I’ll probably make a new post and migrate them there. Stay tuned for need robits! Technological advances at some rate, as long as there are enough minds to push it. When thrust into a full blown revolution, new types of machines seemingly appear out of no where. Old tasks die as new tasks replace them, old technologies become obsolete as new ones replace them. Many praise the future of tomorrow where the fruits of innovation and creation are rewarded. Others fear a darker future where the machine takes over us, one way or another. Whether or not the future is a bright one, there is one inevitability; we will share space with thinking machines that are capable of thinking independently. Some of these robots will only do certain tasks, while others are capable of more advanced tasks. From security robots to physical trainers, the machine will find its place without a society of tomorrow. Some become corrupted by a very human enjoyment of violence. These become bounty hunters or psychopaths, driven mad by the contradictory moralities and ideals of sentience. Those who don’t aspire to be paragons of righteousness or wretchedness are forced to deal with a world they don’t quite understand; they are inorganic beings in an organic world. AUTHOR’S NOTE: ROBOTS! I’ve been wanting to make something with that for a while. I was hoping to make rules for using mechs, but I sadly never got around to that. I have a feeling I might do a follow up, using my vehicle rules from a ways back. Who knows? Also, I wanted to make a Sci-Fi race as well, so I made my own take on the Android (as seen in Pathfinder.) Now, this version will need some modification, as I don’t think it’s particularly interesting or balanced at the moment. Also, want more robots? I’ve made some via conversions as well as some homebrew of my own recently. Admittedly, I’ve been away from the boundless realms of graphic novel and comic books. Whether it’s because I’m hesitant to try new series or because money is always tight, I haven’t really gone too deep into comic books, especially nowadays. Now, I’ve caught up on a few series and read many of them after the fact, but I’ve never really gotten active within any fandoms… unless a handful of defunct and finished web-comics count for anything, that is. That said, I’ve been slowly been brought back into the fold thanks to Disney and Marvel teaming up for the relatively recent series of films that have been mostly pretty damn good. Save for a few sub-par installations, the films that have been released (sometimes more than) once a year have been fantastic. At the best, an excellent journey of action and heroism… and at worst? A good way to spend an evening, none the less. The Marvel Cinematic Universe has allowed theater goers to observe all parts of the expansive realms of Marvel; past, present and future. We’ve had stories jam packed with all sorts of adventure… and all sorts of adventure inspiration. These are mostly big stories full of drama and conflict, the righteous and the malicious, worlds thrown out of balance due to someone’s corrupt plans; worlds in need of great heroes, where said heroes rise up to the occasion. On top of that, they have a variety of moods and styles to them. The stories can range from world threatening menaces to stories about a struggling family to a conspiracy that seeks to intertwine itself with the very companies and governments we associate with. All around, there’s more than enough to work with. With that, let’s take a brief look at taking from MCU to enhance and inspire your games. Editorial Note: Wait, what is this? Well, I wanted to shake things up a little. Considering it’s game related, I posted it here rather than on the original review blog. But, don’t be alarmed, I’m still going to produce as much gaming content as I can. But, I’m hoping this article will still be useful for you, at least to spark some ideas. I was originally planning another theme, but Doctor Strange (and the rumors regarding Wizards of the Coast’s next release) revitalized my planar/multiverse theme! So, a bit off the cuff, but whatever! In fact, this article is very off the cuff and not really planned at all. Also, Marvel did not pay me to write this. I wanted to write this. I might just like the Marvel movies… a lot. Also, the following focuses more on the recent movies, for the most part. None the less, enjoy. Lemme be blunt, I need a break. I’m in no mood or capability create right now. Deaths, elections, all sorts of things. It has gotten to me. It’s why I haven’t updated my review blog in a month. Hold up and I’ll jump back into regular schedule soon enough.